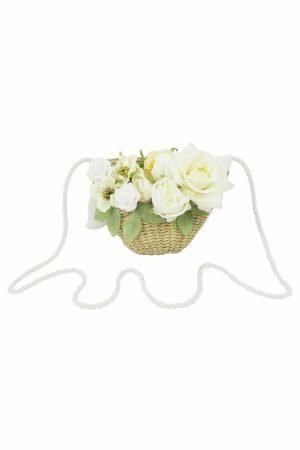 Embrace the natural splendour of spring with our ivory bloom basket bag. The new season calls for an accessories update, and this handbag is sure to appeal to your girl's style sense. The perfect choice to pair with her favourite summer dress, this charming bag is ideal for shopping trips to the farmer's market. Handmade from woven straw, our basket bag offers a modern update with a flawless ivory bloom décor. If your daughter requires a freshly-picked bouquet to polish her spring/summer look, this pretty accessory is sure to personalise her occasion wardrobe. Handy tote shopper bag with ivory cord shoulder strap, tassel detail and zip fastening. Add Parisian flair to your girl's outfit with our fuchsia jewel clustered clutch. The perfect statement bag to introduce a pop of pink, this exclusive edition offers star quality whenever your sweetheart needs a colourful accessory to complement her occasion. Available in a vibrant fuchsia colour with textured lace overlay, the floral pattern lends an exquisite touch so your girl can wow at birthday celebrations and parties all year round. Details include a precious cluster of jewels and soft satin ruched bow attached to a foldover flap. Compact rectangular shape with simple magnetic closure. Detachable chrome shoulder chain. Make a polished statement with our ivory and black mono clutch bag. Exclusively yours, this is the perfect piece to store your girl's everyday items in one stylish package. Special occasions call for extraordinary accessories, and this designer handbag will not disappoint. Whether your daughter has a wedding or party on the cards, see that she's sporting the finest outfit topper with our two-tone clutch. Featuring a chic ivory and black colour palette for a monochrome refresh, this little bag is sure to refine your angel's look season after season. The foldover flap is wrapped in a black ruched bow and sparkling diamanté accents offer instant luxe from the very first glance. Rectangular box shaped clutch bag with convenient magnetic closure. A detachable gold shoulder chain makes this handbag accessible for day or evening. Inspire and delight with this peony pink floral basket bag. A refreshing tote handbag that's ideal for special occasions, this David Charles accessory is the epitome of elegance. Whether your angel is heading to a cinema date or birthday party, make sure she's looking polished with this designer staple. With a woven straw outer material and soft peony pink floral detailing, this little bag makes a charming statement whenever the occasion calls for a touch of modernity. Diamanté accents offset the layered flowers so your little starlet can sparkle wherever she goes. This stylish basket bag features a durable rope strap to be worn over the shoulder or across the body. Single button closure.